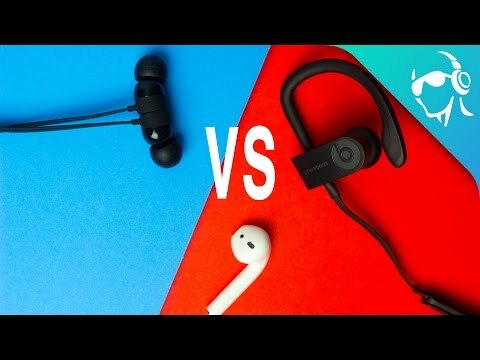 BeatsX vs Powerbeats3 vs Airpods – Which are right for you? Which are right for you? When Apple released their iPhone 7 it was missing a certain 3.5mm jack that we’ve all come to assume was going to be there. Their reasoning was that everything is going to be wireless soon anyway. I’m still not a fan of getting rid of the headphone jack, but there are definitely way more Bluetooth headphones available now than there were just a few years ago. Apple even announced three that same day on stage. There were the Apple Airpods, the Powerbeats3, and the BeatsX. Now unless you really have a thing for Bluetooth ‘buds for some reason, chances are you’ll probably only get one of these if you’re in the market. But which one is the best? Let’s compare the Powerbeats3 to the BeatsX, and we’ll throw in the Airpods too just for fun. The first thing you’ll notice is that these three headphones have completely different designs, meant for their specific use cases. It’s obvious when you look at the true wireless Airpods (which just try to be as portable as possible), but not so obvious when you compare the BeatsX and the Powerbeats3. They both have two earbuds connected by a wire, but the BeatsX have a really long wire and it seems to be because of the neckband. Rather than make the neckband stiff like we see in the LG Tone series, these are made more of a flexible rubber similar to the ear hooks of the Powerbeats3 (if not exactly the same rubber). While the control module on the BeatsX is identical to the one on the PowerbeatsX, The BeatsX also have fairly large modules at the end of the neckband which house the battery. It does look kind of bulky and annoying at first but it means the flexible cable can stay light and thin which I think is a fair trade. The BeatsX also have magnets on the back of the earbuds which means that when you’re not using them you can just let them hang around your neck which is pretty useful. Of course, it’s not a terribly strong magnet so if you accidentally snag it on something it’s still going to go flying off but at least you won’t have wires flying all over the place in regular movement. The Airpods on the other hand don’t have a control module, or even playback controls. All of the ‘buds on these are made of plastic, but they’re slightly different kinds of plastic. The BeatsX and Airpods are both made of a glossy and slightly more premium feeling plastic, but I prefer the matte plastic of the Powerbeats3. That’s just a matter of taste though, maybe you’ll like the glossy more. Of course neither the Airpods or the BeatsX are sweatproof, which has to be the reason for the difference in build materials because the Powerbeats3 are sweat proof. Like any product, it basically comes down to form vs function in the end. It seems like the Airpods were designed to be worn sporadically throughout the day. Granted the build quality of the case is top notch and the closing click is eerily pleasing, but we’re talking about the actual headphones here and the Airpods just don’t do a good enough job at letting me listen to music. You drop it once and it’s lost. The Powerbeats3 look like they were built and designed for the gym. They’re sweat proof and though ear hooks dangling around your neck isn’t the most aesthetically pleasing, they do what they’re supposed to do. Once you’re done just throw them back in your bag or pocket and you’re good. Meanwhile the comfortable flexible neckband, magnetic earbuds, and glossy plastic of the BeatsX leads me to believe they’re best for all-day wearing. So it really depends on what you want to get out of your headphones. But I kind of like the idea of a specialized discrete pair of headphones that let me listen to music whenever I want more than I like the idea of a single purpose pair of ‘buds, so I’m giving this round to the BeatsX. This is where things get interesting because all three of these headphones feature Apple’s new W1 chip. Naturally connecting to iOS on any of them is seamless. Just tap the card that pops up on your iPhone and you’re good to go. They also connect to all of the devices on your iCloud account which is helpful if you’re in the Apple ecosystem. Android users don’t get any cool perks like that but it isn’t any more difficult than connecting to anything else. Just connect via Bluetooth settings. But the W1 does more than just make it easy to connect to. It also helps with battery life and range. We’ll get into battery life in the next section, but I did have some connection hiccups. While paired to iOS connectivity was basically perfect on the Airpods, and slightly less perfect on Android. Skipping music was never a serious issue, but it was more prevalent on Android. The same can be said with both the BeatsX and the Powerbeats3 but to a higher degree. On iOS I had very few if any issues, but while connected to my Android there were a few occasional skips and stutters. Jumping between my Pixel and Macbook on the BeatsX and Powerbeats3 took a few clicks through settings but transition in audio was seamless. The Airpods however always gave me trouble. I’m still not entirely sure how to seamlessly switch between devices that are Apple and non-Apple. If you live in an Apple world this won’t be a problem for you but for the rest of us it’s annoying. Surprisingly, we’re giving this one to the Airpods just because skipping music is my main concern with Bluetooth headphones and they rarely skip. They’re small but they pack a punch and we didn’t even have to mention the nifty auto-pause and play feature you’ll get (as long as you have iOS). Of course playback controls are severely lacking on the Airpods but the connection strength is very solid. One thing to keep in mind when it comes to battery life is how each pair of headphones charges. The Powerbeats3 take a micro USB cable, while the Airpods and BeatsX both take a lightning cable. It’s a little weird that the Powerbeats3 take a micro USB considering they’re a new pair of headphones. They don’t have the newest USB-C or even Apple’s own lightning port. This is good news now since most people probably have a few micro USB cables lying around, but it can be a headache in the future. On the flip side, if you don’t have an Apple device, chances are you don’t have a lightning cable. So you’re going to have to keep an eye on the one that comes in the box and not lose it. All that said, picking a winner is a little easier when it comes to battery life. Spoiler alert: it’s the Powerbeats3. Sure the Airpods get an impressive 4-5 hours per charge, but you do have to charge them back up in the case. The BeatsX fair slightly better at around 6.5 hours in our tests, but the Powerbeats3 beat both of them at 11 hours of constant playback during testing. This one goes to the Powerbeats3 hands down. It comes down to sound quality. I won’t go into excruciating detail here I’ll save that for the full reviews, but we can’t pick a best pair of ‘buds without discussing sound. The Airpods don’t do much in terms of the low end, which could be because of the lack of a true seal. Things tend to sound just like the wired version which is impressive, but if you’ve heard the Earpods that isn’t necessarily a good thing either. The Powerbeats3 do sound slightly better to me, but you have to remember these are the workout ‘buds. Bass is heavy and hits hard with these. I personally feel it’s a little more toned down than the previous model but it’s still bass heavy for sure. BeatsX follow in those same footsteps, but don’t overdo it. They’re far from flat but I would label these as more of “enjoyable” instead of a bassy beast like the Powerbeats3 are. They’re slightly more balanced and way more smooth-sounding in my opinion which is why I give the edge to them in terms of sound quality. So that makes the BeatsX the winner. We didn’t get to it, but another major factor to think about is price. At $149 the BeatsX are also the most affordable of the three. Of course, if you’re in the market for a pair of fitness headphones obviously the Powerbeats3 might be the ones for you. As for the Airpods, if you already have a pair of headphones and are looking for a secondary pair (which isn’t a bad idea) they are really cool and work perfectly. Just don’t expect a great battery life or sound from them. But both of those headphones have their own specific use case. I’d say the BeatsX check the boxes that a much broader audience will like. Comfortable, bass-y but good sound, decent battery life, and designed for all-day use. If you wanted a pair of ‘buds for casual everyday use and have narrowed it down to these three pairs of headphones, I’d say go with the BeatsX.